Aided by the IP54 weatherproof design, the radio supports the effects of rain, snow as well as other climatic conditions. NiMH rechargeable batteries enclosed for up to 10 hours. Or use 3 AA batteries on the move for up to 26 hours. 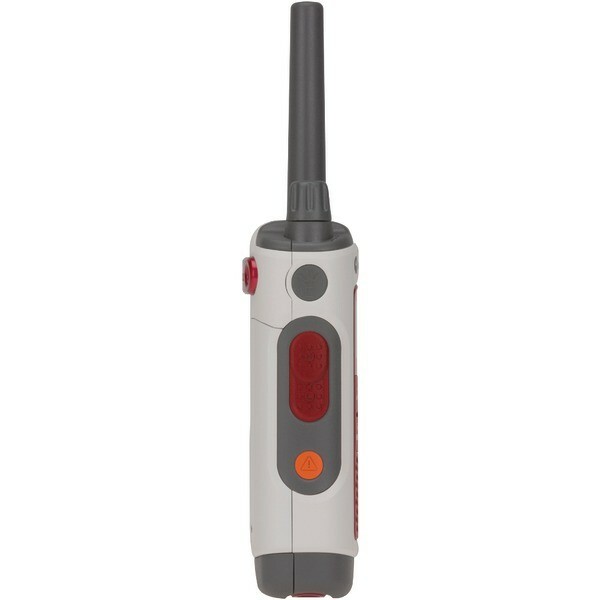 Push-To-Talk (PTT) power boost permits you to extend the transmission range by increasing the transmitter power output. With iVOX/VOX acting like a speakerphone and allows hands free communication while hunting or hiking. The Quiet Talk (QT) feature guarantees uninterrupted communication with many other Motorola radios that also have this feature. 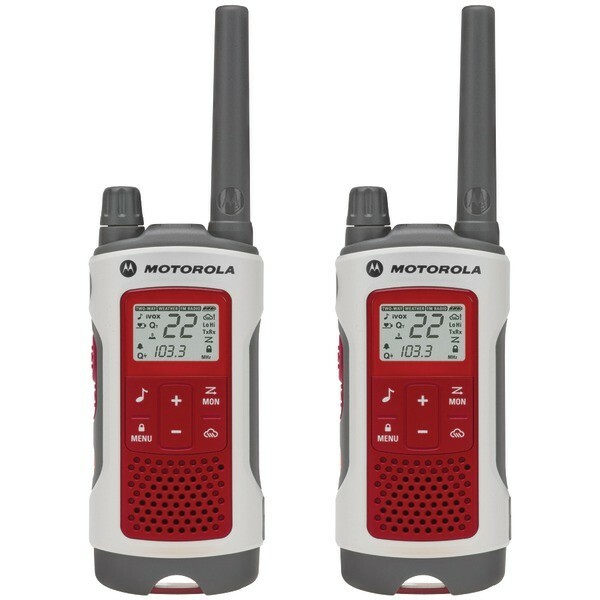 Whether you’re hunting, adventuring, or just want to be prepared in the event of an emergency, high-quality two-way radios are vital – and the Motorola T408 is pretty impressive. 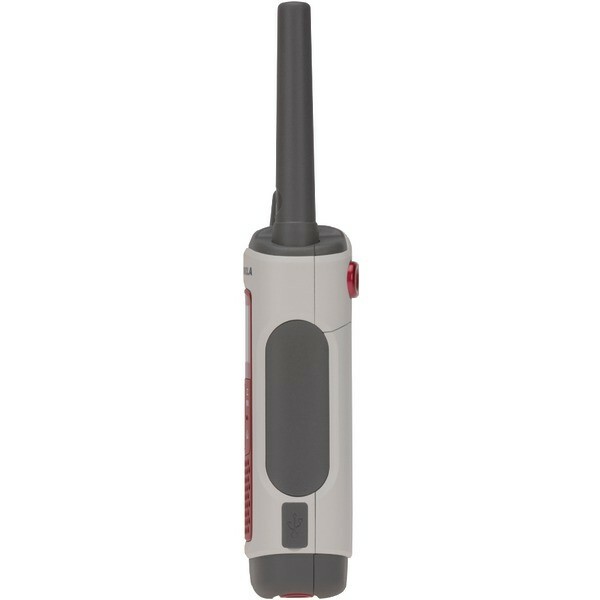 IP54 construction ensures your radio is weatherproof, it’s got a built-in emergency light, and a maximum mountain to valley range of 35 miles. 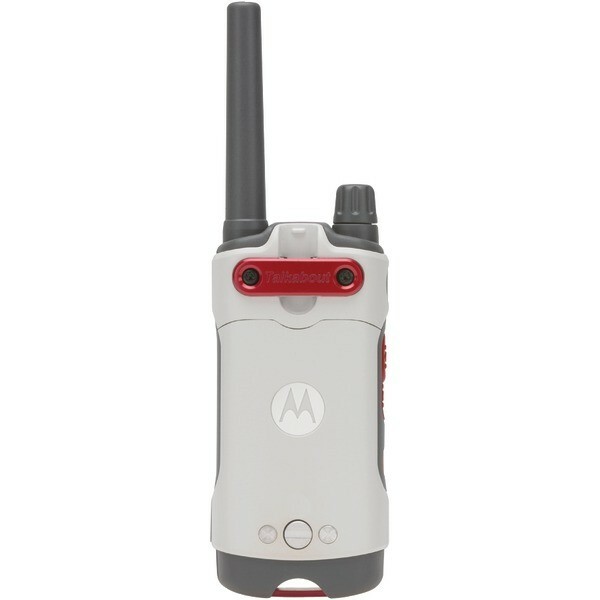 The Motorola T408 boasts an array of useful functions, ideal for outdoor activities and emergency preparedness, so you’re always ready for any eventuality. There’s a good chance that at some point, you’ll need two-way contact in adverse conditions – so you need a radio that’s up to the challenge. And, with IP54 construction technology, the Motorola T480 is a solid choice, capable of withstanding any weather conditions Mother Nature throws at you. Speaking of Mother Nature – she’s notorious for trying to take you by surprise. Suddenly clear skies turn dark as angry storm clouds roll in, or the heavens open without warning and you’re suddenly in the middle of torrential rain. Stay prepared with the T480’s Weather Alert feature and 11 weather channels, including 7 NOAA, and ensure Mother Nature never gets the drop on you unexpectedly. Plus, having a two-way combined with a weather alert radio, means you only have to buy one piece of kit – saving you money and space. 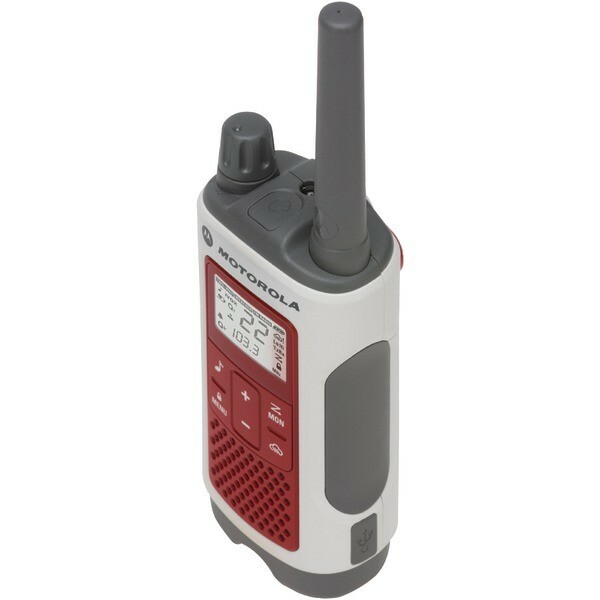 In optimal conditions, with a clear line of sight, this two-way radio from Motorola has a maximum mountain to valley range of 35 miles. 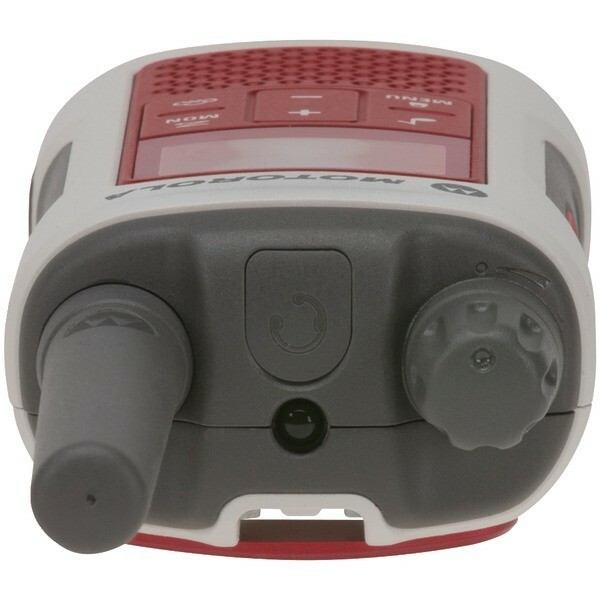 For those seafaring explorers, the radio can manage an impressive 6 miles across open water. If you’re in a built up area, obviously there’s a lot more interference and obstructions, but the T480 still gives you a range of up to 1 mile – plenty for the vast majority of needs. Make sure your community don’t inadvertently ruin your hunt and frighten away your prey, or give away your position to an enemy. Simply turn off calls. You’ll still get weather and emergency alerts, so you’ll still be ready, just in case. Alternatively, if you want to stay quiet but need to stay in touch with your community, plug in the headphones and listen to the chatter without spooking the beasties. If an emergency arises, the last thing you need is to have to hunt around for your radio, or scramble to find enough disposable batteries to power it. Thankfully, with the T480, you don’t have to. Plug the micro-USB charging cable into an outlet and into your radio, then stand the radio in the desk stand, which you can also mount on the wall if you prefer. The power cable sits discreetly behind the stand and ensures your radio is always charged and ready to grab and go. For those times when you really need immediate help, the Motorola T480 features an emergency alert button that, once depressed, transmits a siren, turns up the volume on your community’s radios and locks their buttons for 30 seconds to make sure they know you need help. Hey – Who Turned Out the Lights?!? If you’re camping, in an emergency scenario, or there’s a power outage, a light is crucial, and the T480 features a built-in LED emergency flashlight to help you stay safe. With its plugged-in, always-on connectivity and instant communication, the T480 helps to keep your household ready for emergencies. Even in the event the power has gone out or mobile phone towers are down, your radio will be charged and ready to go, so you can get weather alerts and communicate with your group. What lengths can one expect my radios to speak? The communication range cited is calculated according to an clear type of sight test under optimum conditions. 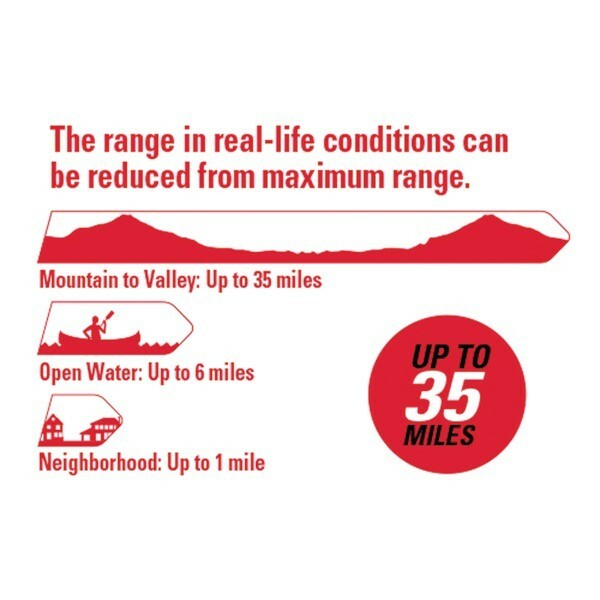 Actual range will be different based on terrain and scenarios, and it is frequently under the utmost possible. Your actual range is going to be restricted to several factors including, although not restricted to: terrain, climate conditions, electromagnetic interference and obstructions. Talkabout T480 has a built-in FM radio. Change to the FM radio mode and listen to your favorite music or news. A light source is always essential during any emergency situation. It’s crucial to be able to see what you are doing and where you are going. This radio has a built-in LED light, which offers emergency lighting when needed. Quiet Charge allows you to charge the radio and turn off calls. You will still receive weather and emergency alerts, so you don’t miss important information. Set your radio to transmit a unique tone when you finish talking. It’s like saying “Roger” or “Over” after you talk. 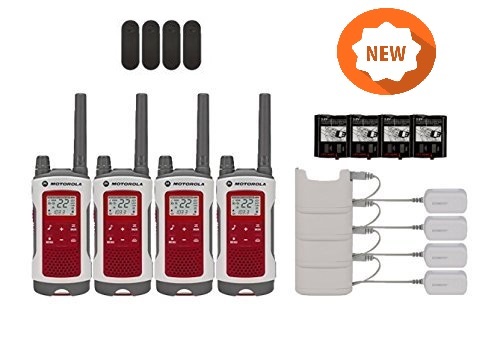 If you have any questions about the Motorola Talkabout T480 Walkie Talkie Set 35 Mile Two Way 4 pack radio, please don’t hesitate to contact us. All questions/comments are routed to our customer support team , so you WILL receive a prompt response!